On Tuesday, January 22, Paris was a few inches deep in snow – the first of 2019, France was on orange alert from the the national weather agency, with more set to fall. However, within the confines of the Grand Palais, all was bucolic and Elysian – a summer breeze, swaying cypresses, an Italianate villa that could be located in Monaco, on Lake Como, or maybe up in Beverly Hills, set against a suspiciously cerulean blue sky. Suspend your disbelief: this was the scene conjured by Karl Lagerfeld for Chanel – ‘Villa Chanel’ – an absolute antidote to reality as casing for his Spring/Summer 2019 haute couture collection. Paris may only have had eight hours of sunshine since the start of 2019 (according to – pardon the pun – grey official figures) but it shines down perpetually on Lagerfeld’s watch. The theme of this show was the 18th century, a favoured stomping ground of Lagerfeld and Gabrielle Chanel alike. In a collection presented 80 years ago, she showed ruffle-collared velvet suits in romantic homage to the painter Antoine Watteau – whose art Lagerfeld once collected, and whose fête galante paintings found a postmodern reflection in Lagerfeld’s models descending that villa façade to take turns around the pool. Lagerfeld doesn’t collect 18th-century art and artefacts anymore – he auctioned the majority of them (over 400 pieces of furniture and 150 paintings) in 2000, when he stated that: “18th-century France represents the epitome of exuberance, youth, balance and harmony. For me, the way that life ought to be lived.” That came tied in with commerce – that Christie’s auction – but it rings true. Lagerfeld was selling us the 18th century here again – although it was the spirit, rather than the actuality, bar gently swaying panniers and delicate flowers that could have been lifted from Sèvres porcelain. Those flowers, incidentally, included real ones – encased in resin, embroidered like sequins, a new experimental level in couture expertise. 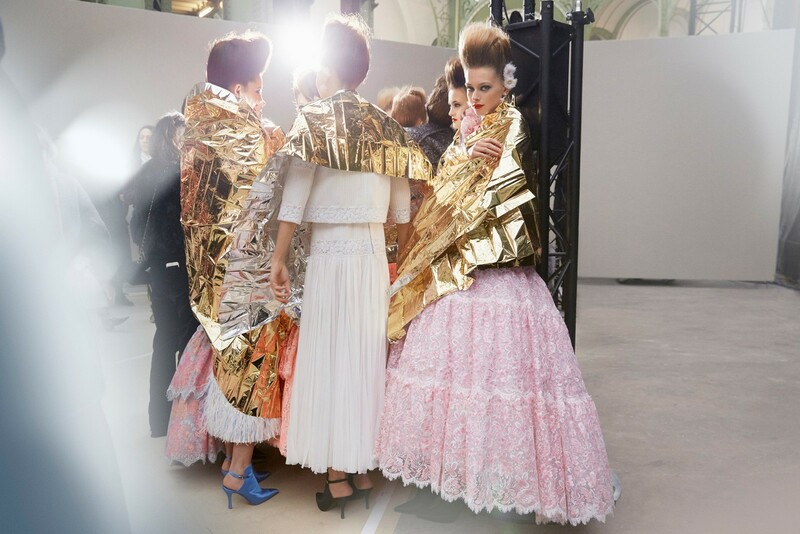 Chanel does that each and every season – both preserving the techniques of the past, a methodology that can trace itself right back to the time of Watteau, and pushing forward to the new. There were also shades here of Lagerfeld’s own past – a stem-slim suit kicking out into pleats that echoed the mid-century, when Lagerfeld’s career began in haute couture; shades of his years at Chloé in the 70s, defining a strong-shouldered, graphic silhouette in precise wool dresses. And, of course, his 36 years at Chanel, breathing new life into the house and placing it at the very pinnacle of the fashion universe. A duo of little black dresses, easy slips caught at one side with bunches of ribbons, were the perfect sublimation of Gabrielle Chanel’s signature styles. She would have worn them herself. It is said – not least by Lagerfeld – that he never likes to look back, only forwards. And there are little more forward-thinking bridal gowns than the space-aged swimsuit version the couturier showed to close this parade. Yet a Chanel maxim sprang to mind watching its passage: “Only with no memory insist on their originality.” This was a litany of Lagerfeldian hits – it looked like a fête galante for right now. The way life ought to be lived, today.